Mason Foster was selected in the third round of the 2011 NFL Draft. 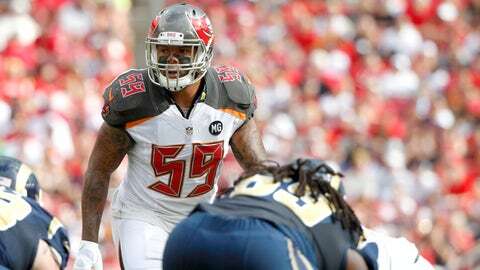 For four years, linebacker Mason Foster has built a resume, working towards his second contract. Over the next week, his future will be determined. For now, uncertainty looms for the 25-year-old middle linebacker. And it’s not by chance that Foster’s name is flying a bit under the radar in this free-agency class. While the Tampa Bay Buccaneers maintain exclusive negotiation rights through Saturday at 4 p.m. ET, the 6-foot-2, 240-pound tackling machine will be pursued by multiple teams as he tops the list of available three-down middle linebackers in free agency. "I loved my time in Tampa and I’m excited for the next chapter in my career, whether that be here or somewhere else," Foster told FOXSports.com. "I know my best football is in front of me, and I can’t wait to get back on the field and contribute to a winning season." The reality is Foster had been the quarterback of Tampa Bay’s defense for three seasons. During that span, he averaged 94 tackles, two sacks and two interceptions a season. Then, a coaching change occurred, which came with a change in defensive philosophies. The Bucs transitioned to a Tampa-2 defense, which stresses middle linebackers to drop in coverage. Foster, known more for his instincts and physicality, wasn’t a natural fit in the scheme, but it’d be wrong to label him as a guy who lacks speed or coverage ability. "Mason is a tough, physical, smart inside linebacker," former Buccaneers general manager Mark Dominik told FOXSports.com. "He sees plays develop. He plays downhill and he’s a very strong tackler at the point of impact. "The good thing about Mason is not only can he play in the 4-3 as a Mike (middle) or a Sam (strong side), but he can play in the 3-4 at either middle linebacker spot. He has versatility to play for just about any defense in the league." Dominik, who drafted Foster in the third round from Washington in 2011, also works as an ESPN analyst after being fired from Tampa Bay in 2013. Foster’s versatility can be highlighted by the way he adapted to change. In four seasons, Foster played in three different schemes. Transitioning from head coaches Raheem Morris to Greg Schiano to Lovie Smith wasn’t an easy task, but his mental aptitude allowed him to rely on his instincts and athleticism to make plays. "I don’t think people realize how smart he is," Dominik said. "He really does understand defenses. He can make the calls, get guys lined up. That’s a very valuable thing when you look at middle linebackers." Aside from the change in defensive philosophies, Foster sustained a separated shoulder and a strained Achilles last season. The injuries caused him to miss six games, which naturally caused a dip in his production. 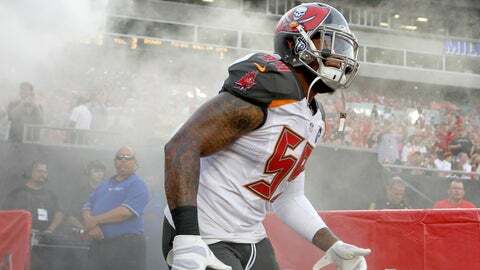 Mason Foster has started at middle linebacker for four seasons in Tampa Bay. Tampa Bay’s defense was substantially better with Foster on the field in average points, total yards, pass yards and rush yards allowed, Bleacher Report’s Jason Kanno referenced last December. "Again, you like the linebackers that, when they hit opponents, they’re not getting dragged three or four yards," Dominik said. "They’re actually creating a play and making an impact and that’s what Mason does." Foster is the youngest in a healthy free-agent class at middle linebacker, which include New York’s David Harris (31), Cincinnati’s Rey Maualuga (28) and Buffalo’s Brandon Spikes (27). Teams looking for help at inside linebacker include the Atlanta Falcons, Minnesota Vikings, Houston Texans, Chicago Bears, New York Giants and Green Bay Packers. Foster might not be headlining the free agency conversations, but teams who typically sustain success treat this time of year as a way to make stealthy signings to enhance their team. For Foster, manning the middle comes with a certain responsibility. With the work he has done in the past, it’s only a matter of where he’ll be playing next season.